Chez Josephine is a bubbly return to the joie-de-vivre of Paris of the 1930s – le Jazz Hot with soul. A tribute to legendary entertainer Josephine Baker founded in 1986 by Jean-Claude Baker, Chez Josephine offers a French-American menu and live piano music in an intimate Parisian setting. This landmark jewel is inviting and romantic with its blue-tin ceiling, red velvet walls and cavalcade of chandeliers that light up vintage portraits of La Baker. 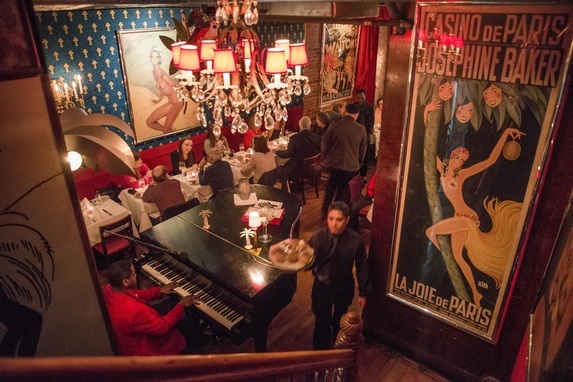 Ideally located on West 42nd Street along Theatre Row, Chez Josephine is a magnet for dining before or after the theater; as well as a Hell’s Kitchen haven for a leisurely dinner or quick drink at the zinc bar. View our photo gallery, and come join us! We look forward to welcoming you very soon — make a reservation today!